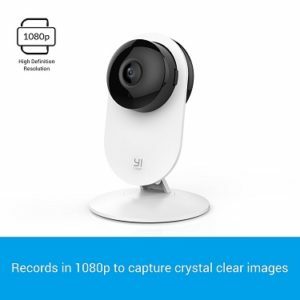 The YI Wireless IP Home Security Camera & Nanny Cam is really affordable at the moment and has all of the features you need for both home security and to keep in contact with your children at home. It has 2-way communication, a digital zoom, wide angle lens, sound & motion detection and alerts, an SD card slot, cloud storage and high level encryption. No wonder the YI Wireless IP Home Security Camera is a Best Seller on Amazon! Wide angle lens (112 degrees). Manual pan & tilt (no remote function). 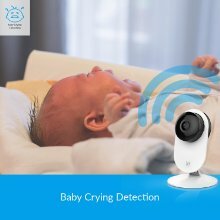 Sound & Motion detection (Baby Cry Alerts). SD card slot & cloud storage. IR night vision (up to 9 meters or 29.5 feet). Compatible with iOS 7.0 or Android 4.0 and above. Works with 2.4Ghz network – not 5 Ghz. The YI nanny cam is an IP camera and it is also wireless. What is an IP camera? IP stands for Internet Protocol, so an IP camera is one that can send and receive data (images and video) over the internet. What is a wireless camera? A wireless camera transmits a video and audio signal to a wireless receiver. Many wireless home security cameras and nanny cams have power cords and need to be plugged into a power outlet. Wireless does not mean that it is battery operated, it simply refers to the transmission of data (videos and images) from the camera to a wireless receiver (home modem). So even when your computer is turned off, the wireless camera can still connect with the wireless receiver, allowing you to see and speak to someone at home, and it can still send sound and motion alerts to your mobile device. The advanced speaker and microphone in the YI Wireless IP Home Camera and nanny cam allows you to have very clear conversation with your partner, babysitter or your children at home, while you are away at work. This is a very nice feature for a nanny cam, because you can talk to your children while they are completing their homework or sing a lullaby to your baby in the nursery as they drift of to sleep (while watching them at the same time). The YI 1080p nanny cam has a x4 digital zoom, so you can see a close up of your baby in the nursery, but it doesn’t have an automatic Pan & Tilt feature. Instead you would need to manually turn the camera, which isn’t very useful when you are working remotely. However, to compensate for this lack, it does have a 112.0 degree wide angle lens (diagonal) and a wide field of view (94.5 degrees horizontal x 49.0 degrees vertical), which customers find really useful and practical. 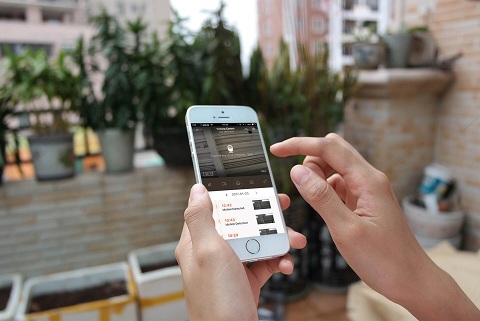 With the YI nanny cam you receive real time sound and motion alerts on your mobile device. Any sounds made by your baby will be picked up within 5 meters (16.4 feet) of the camera and you will be sent a 6 second video clip to your mobile device. So if your little one climbs out of their cot you will be sent a motion alert and if they start crying, you will be sent a sound alert. You can customize these alerts, increasing or reducing the sensitivity of the camera to these triggers, so you are not send alerts constantly. If you decide to use the YI as a home security camera in the future, then you can increase the sensitivity of these triggers, so you are alerted to any sound or motion when you are not at home. The SD card slot can take anything from an 8GB to 32GB card, giving you up to 64 hours of recordings on a 32GB card. 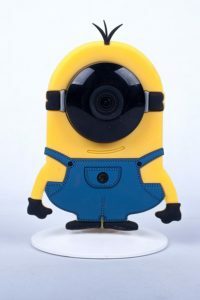 Having an SD card slot on your wireless IP home security camera is ideal, because even if the internet connection is lost or has dropped out momentarily, the camera will still record to the SD card, ensuring that none of your precious moments are lost. You also have the option of cloud storage as well, which is great if your home security camera is stolen, because you still have all of the videos saved to the cloud. Just imagine if some burglar sees the camera inside your home and steals it, thinking that you won’t be able to identify them – but the videos were sent to the cloud! Free cloud storage: The YI FREE cloud storage plan stores your videos on the cloud for 7 days and then it will loop over the stored recordings. So you always have the last 7 days of recordings saved. Standard Plan: Save the last 15 days of videos on the cloud ($9.99/month) or the last 30 days (14.99/month) – up to 5 cameras, but motion detection videos only on the standard plans. Premium Plan: Save the last 15 days of videos on the cloud ($9.99/month) or the last 30 days (19.99/month) – only one camera, but it does have CVR on the premium plans. These are the current plan costs, which might change over time. All you need to do is to download the app onto your phone and you will be given the option of the free plan or one of the other plans. The apps can be downloaded from Google Play and the App Store. 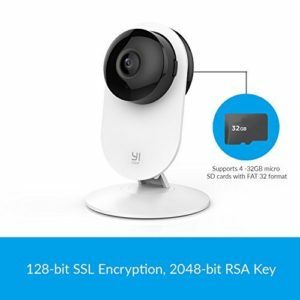 YI has invested in the best security protection for their home security cameras and nanny cams, using 128-Bit SSL Encryption, a 2048-Bit RSA Key and requiring you to enter a PIN code to access your videos. With all the problems of people hacking into home surveillance systems seen on the media, it is good to know that this YI nanny cam is fully secured with the latest technology. With both high definition and low definition recordings you always have the very best viewing quality your internet can handle. 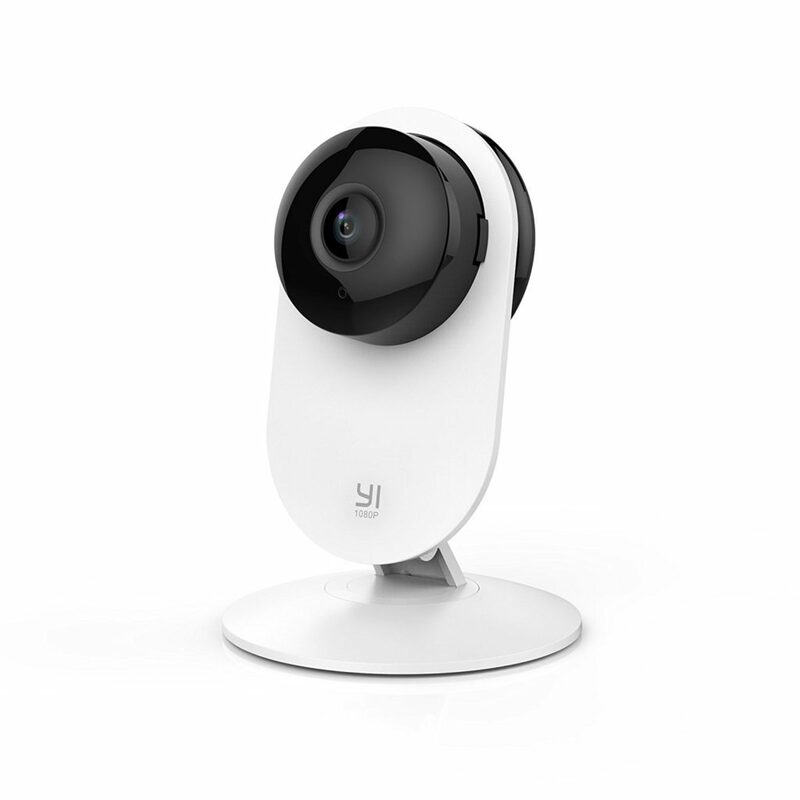 If your connection speed is poor, the YI Wireless IP Home Security Camera automatically adjusts the recording, so that you enjoy an uninterrupted viewing experience. The app actually notifies you if it detects a change in the connection speed and prompts you to switch to the alternate streaming mode. This is not a function that I have seen on any other security camera or nanny cam. 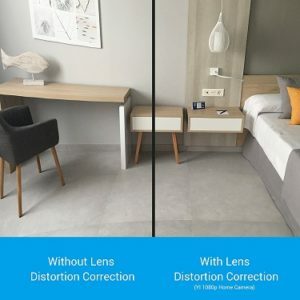 Your YI camera automatically corrects for any distortions that occur due to the wide angle lens, ensuring that your real-time videos are absolutely perfect. This is a great feature when some wide angle lenses can cause a ’rounded’ distortion to the videos, giving you a poor viewing experience. The YI home security camera and nanny cam can be set up in 3 easy steps! Download the mobile app onto your smart phone. Plug in the power cable of the security camera. That is all there is to the installation and online customer reviews verify how easy it is to set up this nanny cam for even novice users. As a Best Seller on Amazon, this is a very popular nanny cam and home security camera that is very well priced and easy to install and use. It has all of the important features you need and many of them can be customized to your requirements. It was a breeze to setup and get everything going. After install of the App in my smartphone, it only took me 2 minutes to connect it to my wifi network. Its very easy going to use it. I am amazed and pleased that I can be hundreds of miles away and still be able to monitor my front porch. I bought 1 of these and after it was set up, I knew I needed another one. So I ordered a 2nd device. I have 3 cameras in my house and three more in my mom’s house. I shared my mom’s cameras with my account so I am able to see my house and her’s. Not only is the 1080 picture quality outstanding but it trumps all other cameras I have purchased before and returned due to disappointment. 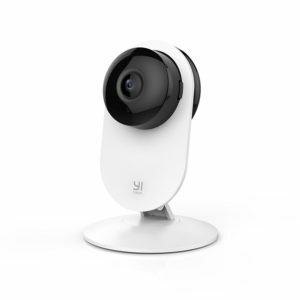 If you are searching for a nanny cam that can be easily re-purposed as a home security camera when your children are grown and is affordable with great customer reviews, then the YI Wireless IP Home Security Camera ticks all the boxes. It has all of the features you need: 2-way communication, digital zoom, sound & motion alerts and SD storage, and it has lots of other cool features as well. You can even buy a cute Hide-Your-Cam Camouflage Cover Skin (shown on the right) for your YI nanny cam, which is perfect for the nursery. Overall, this is a great nanny cam that is packed full of features and if you find it selling for less than $100 – grab it with both hands! Compare the most popular nanny cams here.